I grew up eating these Danish Christmas Butter Cookies (Vaniljekranse) every Christmas, even if I knew little about their country of origin. It was a tradition in our country, and they showed up in stores at the same time as many other Christmas goodies. That is not the only reason why this recipe is here. This is not something that people make at home in our country. It was only when my husband – who hails from Denmark – and I decided reproduce that I knew I had to learn how to make these. If we were going to incorporate it into our mixed-family traditions, they’d better be the real deal. The traditional Danish butter cookies are called vaniljekranse or “vanilla wreaths” in Denmark and, although more popular during Christmas, they can be found throughout the year there. But when my husband tried the ones you buy from a tin here, he was hugely disappointed. It was only when I tried the handmade ones that I knew why. There’s really no comparison. The original vanilla wreaths have the shape of a wreath (not surprisingly), but since I can do whatever I want with mine I made some in the traditional shape from the tin cans, a lot of round ones (sprinkled with coconut or with a whole almond) and using the cookie press some in the shape of Christmas trees, flowers and hearts. This Christmas, try these, you’ll see why our family loves them so much. Danish Christmas Butter Cookies (Vaniljekranse) Recipe: Popular as a Christmas treat or as a season gift, we bring you the real deal. They're amazing! Using the food processor pulse the almonds until they turn into powder (the same texture as polenta or granulated sugar). Mix all the dry ingredients (flour, sugar, and almonds). 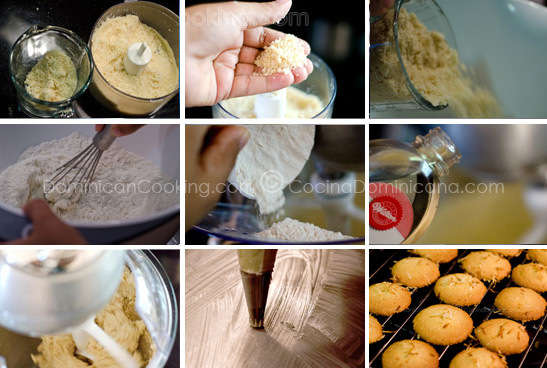 Mix butter and dry ingredients in your mixer until everything is mixed well. Add egg and vanilla, mix well. Make a ball with the dough, wrap in plastic film and let it rest in the fridge for half an hour. Pre-heat the oven to 350 °F [175 °C]. Form the cookies (see suggestions in the notes). Bake for 10 to 15 minutes or until cookies are golden yellow. Cool in a wire rack. When the cookies reach room temperature place in a hermetic jar. This recipe was adapted (with a lot of modifications) from the book Dining with the Danes by Lynn Andersen. To make the traditional wreath shape place the dough in a piping bag with a medium-size star tip and pipe a ring of 2" in diameter. You can also use a cookie press (I have this one to make cookies in fun shapes. If you dont have a piping bag or cookie press you can make round cookies by forming a roll with the dough after you cool it down in step 5. Leave the roll in the fridge for an additional hour and then cut into slices 1/4" thick and bake immediately. To decorate these circles with almonds or coconut do it before baking. If you are not going to eat all the cookies the same day is best if you keep the jar in the fridge to keep them fresh longer. I made these and I loved them, better than the ones from a can. Thanks. The cookies look delicious and crisp! Have a wonderful and blessed Christmas!